A few weeks after saying he was disappointed in Timbaland for airing out an unreleased version of his “Movin’ Bass” collaboration with Jay Z, Rick Ross followed up on a Tweet sent by the official Maybach Music Group Twitter account taking aim with the producer’s own Mosley Music Group branding. Yesterday (December 6), Timbaland posted a promo image of his own Mosley Music Group label on Instagram. 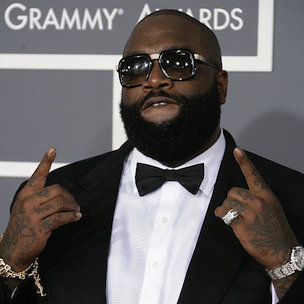 Shortly after, Rick Ross followed with his own Tweet with the hashtag #WhereMagoo, an apparently underhanded reference to Timbaland’s longtime collaborator and rapper. Late last month, Rick Ross joined Sway Calloway and Rob Markman at the YouTube Space New York for a Google Hangout session promoting the release of his new Hood Billionaire album. When asked about the unreleased version of “Movin’ Bass” featuring Timbaland’s artist Tink, Rick Ross explained how that version came about and why he was disappointed to see it released.